When you’re dreaming of a wedding celebration in an exotic and romantic destination, one vision usually dances in your head. You picture yourself saying “I do” with an endless sand beach spread out before you, lush palms waving in a tropical breeze and a touch of sun kissing your skin. Sounds fantastic, doesn’t it? Those visions come to life in the jewel of the Mexican Riviera - Puerto Vallarta. And Velas Resorts makes it easy to soak up all the sun-drenched vibes - before, during and after your special celebration. Velas Resorts knows that planning the ultimate destination wedding can be a stressful experience, at least if you try and do it from afar. It’s easy to get overwhelmed by all the choices. From picking the ideal venue and arranging travel for family and friends to selecting flowers and your one-of-a-kind wedding cake, there are just so many decisions. Which is why Velas Resorts makes it easy to plan the perfect celebration in paradise. We start with the easy things, designed to pamper and please. Lose yourself in our luxurious guest suites and rooms, serene spa, decadent dining, fun activities and exciting adventures waiting just outside your doorstep, including world-class golf. Our sugary sand beach and dreamy location overlooking myriad blues of the Pacific Ocean invite you to share moments of laughter and love together. Then we make it even easier by offering experienced wedding planners to help bring your dreams to life, down to the smallest detail. They will help you arrange the special touches that make your celebration unforgettable, from fresh flowers, creative cuisine and custom cake to artistic photography, aerial drone footage and live entertainment. 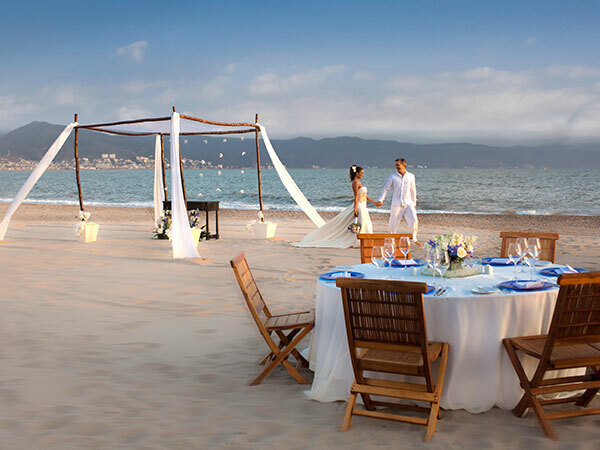 So, go ahead and take the plunge, with a dream destination wedding in Puerto Vallarta. Velas Resorts makes it easy to live your dreams.